1 of 3 In a small bowl, mix together garlic powder, onion powder, 1/2 teaspoon of the salt, black pepper, cinnamon and cumin. Reserve 1 teaspoon of the spice blend. Rub the remainder over the pork tenderloin and place in a resealable plastic bag. Refrigerate for at least 2 hours or overnight. 2 of 3 Heat gas grill to medium-high or coals in charcoal grill to medium hot. Lightly coat grill rack with oil or cooking spray. Grill 14 to 15 minutes, turning twice, or until internal temperature registers 150 degrees F on an instant-read thermometer. Remove from grill and let rest 5 minutes before slicing. 3 of 3 Place chicken broth and onion in a saucepan. Bring to a boil; simmer 3 minutes. 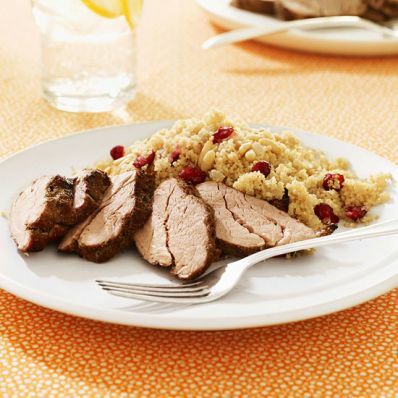 Stir in reserved rub, remaining 1/4 teaspoon salt, cranberries and couscous; cover and let stand 5 minutes. Fluff with fork, garnish with pine nuts and serve with pork.